St Mark’s, Kennington was one of four churches built in London in thanksgiving for the victory at the Battle of Waterloo, opening in June 1824. The architectural style is neo-classical. The front entrance is in effect a Doric portico, but above it is an Ionic cupola. This evokes the 4th century BC choregic monument of Lysikrates in Athens (though constructed in a Corinthian architectural style). The front of the church is in the Doric style evoking classical buildings such as the Hephaisteion at Athens that stands above the Agora. This sea-horse features among the sea creatures at the bottom of a large mural of St Christopher in the church of St Mary the Virgin at Layer Marney in Essex. The painting dates to c. 1520; its good condition is due to the fact that it was overpainted in the Reformation. It was rediscovered when the church was re-ordered in 1870. The Ruthwell Cross now stands in a specially constructed apse (1887) in Ruthwell Parish Church (although it is in the care of Historic Scotland). It is some 5.7 m in height, and dates to the early 8th century. The inscribed text includes sections of The Dream of the Rood linked to Caedmon. The cross stood at the entrance to the Manse from 1823 to 1887 (when it was placed in the church). We would like to read readers of Heritage Futures a very Happy Christmas. Can the Church of England sustain its almost 16,000 church buildings in the face of declining and ageing congregations, especially in rural areas? The report includes a mention of Suffolk, a county with a wealth of historic churches. There are also other issues facing rural parishes, such as the shortage of clergy and lay officials willing to serve in rural communities. But the rector of St Nicholas church in Rattlesden in Suffolk, Reverend Christopher “Tiffer” Robinson, says that is no reason to abandon smaller countryside churches, which he believes are often the lifeblood of their local village. “While so much of the rest of society counts things in terms of population or numbers, and says ‘there aren’t many people there so we’ll withdraw from there’, in the Church we don’t think in those ways,” he says. His congregation agrees, seeing their parish and their church as a community that has been there for them throughout their lives, especially at difficult or happy times. In Suffolk, the Diocese of St Edmundsbury and Ipswich has been promoting its churches through a clearly articulated church tourism strategy linked to walks (“Angels and Pinnacles“). The Bishop of Worcester is right to observe: England’s rural parish churches are “the jewel in the crown of our national heritage”. 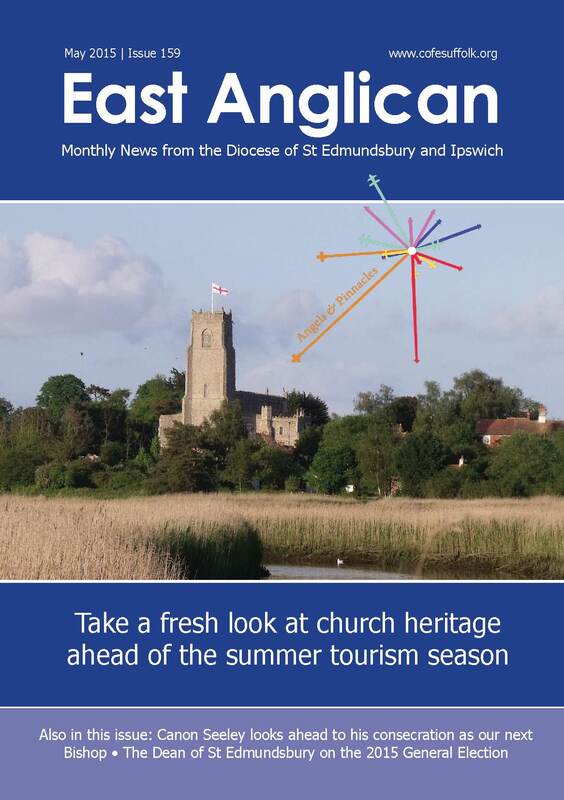 The May edition of the East Anglican (the diocesan magazine for St Edmundsbury and Ipswich) has a feature by Marion Welham on church tourism and the Angels and Pinnacles initiative. It notes the launch of the ‘Bells and Battlements’ launched at the Suffolk Unlocked event at Trinity Park, Suffolk (2015). There is a mention of the Heritage Futures seminar led by Marion earlier in the year.